A month ago it was reported that one of the first 7nm processors, the Apple A12, was in mass production at TSMC in Taiwan. That news came from 'people familiar with the matter', anonymous industry sources, via Bloomberg. 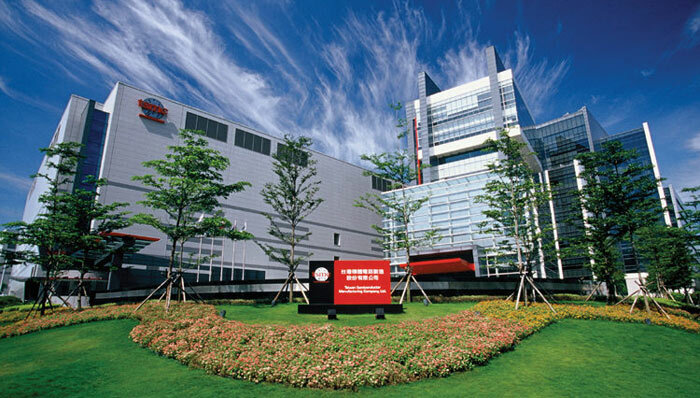 Today we have much stronger confirmation that 7nm production has been scaled up to meet volume commercial demand thanks to a statement from TSMC CEO CC Wei, as reported by Taiwan's DigiTimes. Wei's comments were delivered at TSMC's technology symposium in Hsinchu, Taiwan on 21st June. The CEO was deliberate in his comments, aiming to dispel rumours that the firm's 7nm production yield rate was raised at a slower-than-expected pace. Providing deeper production performance details to the gathered audience, Wei added that the ramp-up of 7nm chip output will boost TSMC's overall production capacity to 12 million 12-inch equivalent wafers in 2018. That figure is a substantial gain on 2017's figure of 10.5 million units. We are already pretty sure that Apple's A12 will be rolling off the TSMC 7nm production lines but what about other CPUs, GPUs and processors? Wei told his audience that TSMC will tape out more than 50 chip designs with its 7nm process technology by the end of 2018. The first chips out of the plant will be orders from companies wanting to provide next generation AI, GPU and cryptocurrency solutions, it was indicated. Next in the queue would be 5G chips and SoCs, said the TSMC CEO. As well as Apple, notable customers queuing up for TSMC output include; AMD, Bitmain, Nvidia and Qualcomm. An enhanced 7nm node with EUV would be ready for taped out chips in H2 2018, the TSMC CEO indicated. TSMC's 5nm node will start risk production in H1 2019, with mass production estimated to follow at the end of 2019 / beginning of 2020. Looks likely to be the end of Intel's process lead that they've had for umpteen years. 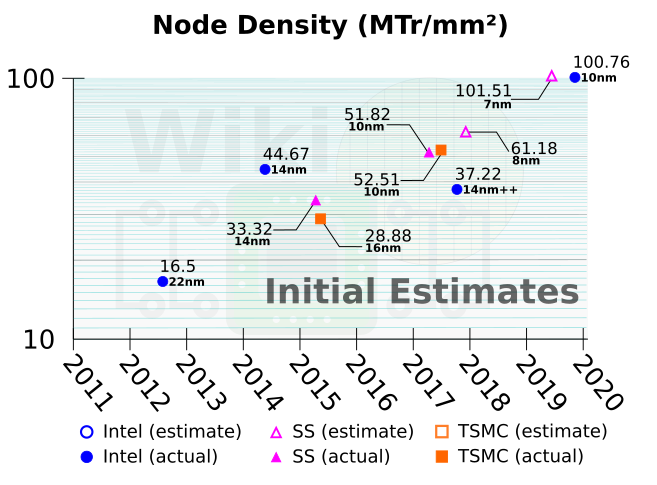 That depends on the actual node densities though, Samsung 10nm node density was 51.82, TSMC 10nm node density was 52.51. Then you have Intel 10nm node density at 100.76. Not all processes are the same or equal. Agreed, though it has to be said that Intel's matured 10nm should be similar to the other fabs on 7nm, still their lead is gone. Not to say that you're wrong or anything, but I don't like the numbers on this graph, looking at Intel's actual 10nm numbers I'm calling BS. If it was estimated I'd say maybe, because take the 10nm low power i3-8121U they've just released, its not even up to scratch with their current 14+++++ or whatever their on now. Eventually their 10nm process will hopefully get to where it's estimated to be, but the actual 10nm is currently below their current 14nm process albeit very matured 14nm. Though I understand that the 7nm and 10nm would be the same once all the issues of current 10nm is resolved, i'd wager that current 7nm are leagues ahead of current 10nm. And with 7nm on mass production Intel will need to sort out their stuff fast. Though it can be argued that I've got little proof to show for 7nm, but that i3-8121U shows us enough to start thinking, while the 7nm process are showing crazy scaling compared to GF's 14nm (which can also be argued isn't Intel's 14nm) ,but either way 7nm will be better than Intel's leading 14nm which in turn places it firmly ahead of Intel's current 10nm.